Polymyxins are polypeptide antibiotics that bind lipopolysaccharide (LPS) and disrupt bacterial membranes. They are used for the treatment of Gram-negative bacterial infections. Since polymyxins increase permeability of the bacterial membrane system, they are also used for enhanced release of secreted toxins from bacteria. 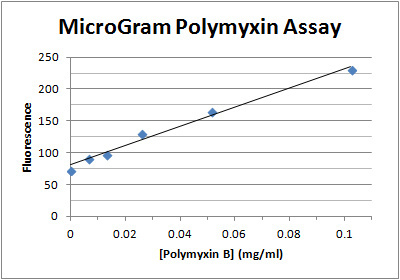 The MicroGram Polymyxin Assay Kit (Catalog number MPX200) is designed for measurement of microgram/ ml concentrations of polymyxins. The assay is based on increase of fluorescence at 535 nm of the assay reagent in the presence of polymyxins. The assay kit can be used for measurement of polymyxin concentrations in drug discovery, drug development and pharmaceutical samples. The MicroMolar Polymyxin Assay Kit (Catalog number MPX200) provides the reagent for measurement of 200 samples using 96-well plates. Cuvettes may also be used for measurements.